Travel is always so inspiring to me as a cook. I return from trips overflowing with ideas and possibilities. Apart from my Chinese heritage, I would say travel is the single most important and consistent influence on me in all aspects of my life, not just in the kitchen. An experience of the world never leaves you. Often unknowingly, it seeps into every part of your life and consciousness. For me, the physical evidence of world experience usually manifests on the plate. Our recent trip to Playa del Carmen had me thinking about Mexican food in a new way. The food there is full of color and vibrancy. But even though the food is punchy, there is also a delicacy and subtlety to the flavors. The dish I loved most was chilaquiles verde, a traditional peasant dish of fried tortilla chips bathed in salsa verde. 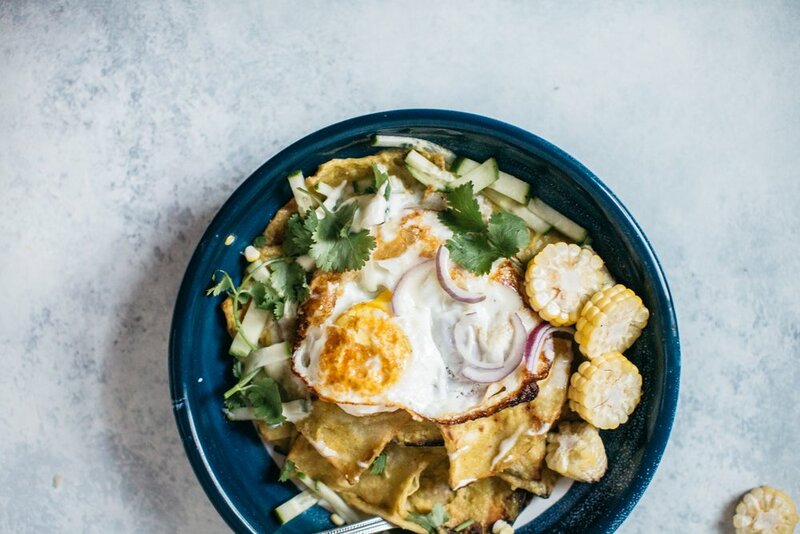 As with many of the great dishes of the world, chilaquiles has humble beginnings – the dish was born in Mexican homes as a way of using up leftover tortillas and salsa. In Mexico, we ate chilaquiles with a fried egg for breakfast but for me, it’s the perfect dinner for all the family. My kids didn’t try this in Mexico but at home in Brooklyn, they loved it served with a fried egg, cucumber, corn and crème fraiche. For the salsa verde, I used tomatillos, which are similar to unripe green tomatoes. In America, they are very common but in Australia, they are probably impossible to find. I certainly can’t remember seeing them anywhere but please leave a comment if you know where to buy them. For non-US readers, substitute the tomatillo with unripe tomatoes and perhaps add a squeeze of lime juice to mimic the tomatillos signature tartness. I fried corn tortillas to make chips but you could just use good quality, store-bought corn chips (choose unsalted if you can). If you are using unripe tomatoes in place of tomatillos, remember to add more citrus (lime) to the tomatoes to inject some tartness. Cooled salsa can be stored in the fridge in a clean, sterilized container for up to 2 weeks. Heat a saucepan over medium-high heat; once hot, add olive oil, tomatillos and jalapenos, along with 2 tablespoons of water. Once it boils, reduce heat to low and cook until it is very soft – about 10 minutes – stirring often. Place the tomatillo mix into a high-powered blender, add the coriander along with a pinch of salt and a few turns of black pepper. Blend until smooth. Taste and season with more salt and a squeeze of lime juice. Set aside. Add a good drizzle of oil to a large, deep skillet and heat until it is very hot (you could also use a deep fryer or wok). Reduce the heat to medium, and panfry the tortilla chips, working in batches, turning them so that both sides are golden and crisp. It should take less than 3 minutes for each batch. Transfer to a paper towel to drain, and immediately sprinkle with sea salt. In a large skillet, add a drizzle of olive oil, along with the salsa verde and vegetable stock. Stir and bring to a simmer. Add the fried tortilla chips, turning them to coat the chips in the sauce. Cook until the tortilla chips are warmed through. 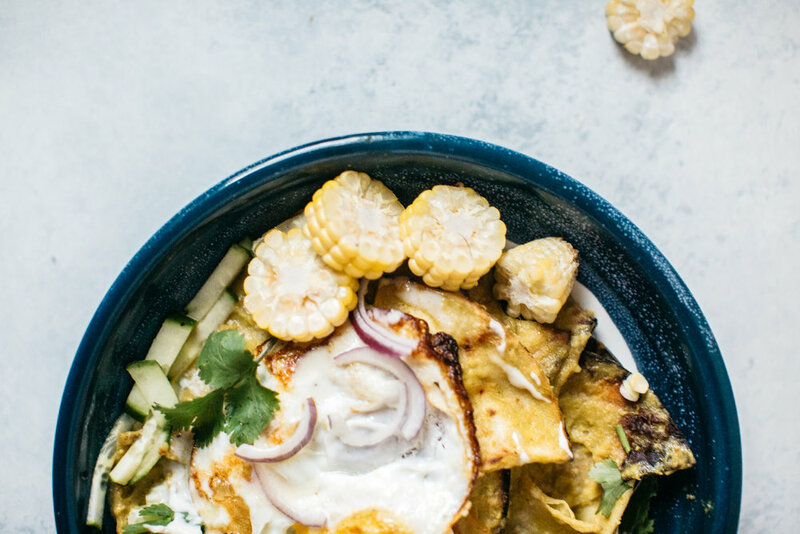 To serve, spoon chilaquiles onto a serving plate, top with a fried egg, sliced cucumbers, corn, cheese and spoonful of crème fraiche and a scattering of coriander leaves.